Would you like to receive the Picks of this strategy? Follow this quick and easy guide to create this strategy in the Betamin Builder tool. In this post, we are going to analyse a new betting system to bet against the favourite team. Check details below! This system is based on the trends of the teams for a short time, the last three games. The goal of this strategy is to search teams playing at home with a good winning streak as a Home team, and the rival team should have the opposite trend: NO Wins when played away in the last three games. 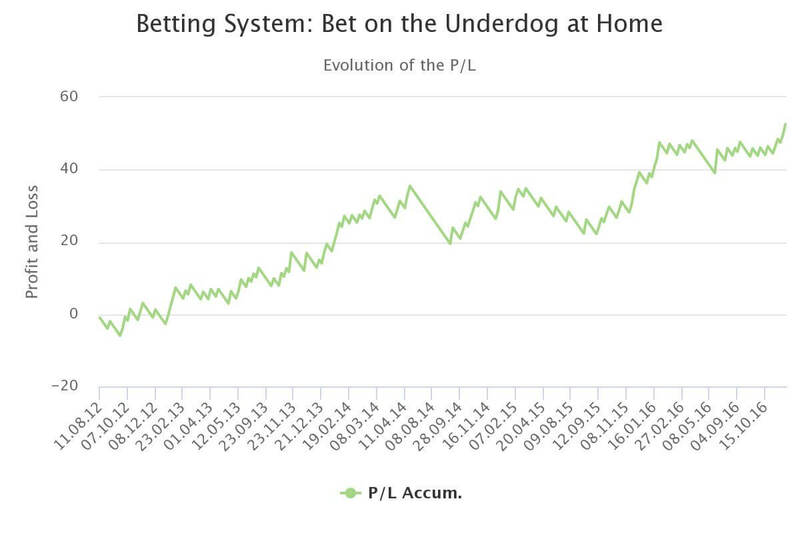 This system works when the Home team is the underdog, not the favourite. We want to take advantage of the good form of the underdog teams, although the odds set for that team are against them. For this kind of system, we decided not to filter or remove any league from the results. Some competitions could be deleted from this strategy to make a higher profit, but we want to show you the results for all the leagues we have collected data. Leagues. We have tested this system with 17 leagues. Odds. Odds are taken from Pinnacle Sports, pre-match. Seasons. From season 2012/2013 to the current one 2016/2017. Date range. From July 2012 to 24/11/2016. P/L Calculation method. To bet one unit on Home Team, when the conditions are fulfilled. Home Team conditions. At least two wins in the last three games played at home with odds from 3.00 (2/1). Away Team conditions. No wins in the last three games played away, all odds included. The Trigger of the system. If those conditions are fulfilled, the system places a bet on the fourth match. Yield. The Yield obtained in the system: 19% after 273 bets matched in the strategy. Discover 8 new profitable football betting systems based on Big Data clicking here!!! The system obtains a positive result, a 19% yield after 273 bets and more than four years. As you can check, the system is profitable for most of the football leagues tested. The league with the highest yield is Eredivisie, 154%, although only 7 games were matched. The English divisions are the ones with more bets matched, and a good result in each one. The odds for the underdog teams are high; this is the reason why the strategy will have a small ratio of winning bets. When a new strategy is developed, it’s important to understand the general concept of the system, not only this one in particular but as a rule. You cannot expect immediate results for this kind of strategies. Odds for your betting team are usually high, and the bets won ratio is small, in this research, only three out of ten bets were won. For this system, you should have patience. Otherwise, you can quit the strategy prematurely with no results. Besides, this system doesn’t trigger many bets, for the 17 leagues, about 60 bets per season. You should consider all these factors explained above before taking a decision. If you decide to follow this strategy, please remember that you have the final say to place a particular bet. If we analyse the results by odds range, we can confirm that the system works for every interval, where the highest profit is made from 3.00 to 3.50. Each interval has a consistent profit; that means that those odds fit for the strategy. In this chart, you can see the distribution of the profit per odds interval. Here you can find the detail of all the past football games that fulfil with the filters and conditions of the betting system. Div Date Home Team Away Team Full Time Home Goals Full Time Away Goals Full Time Result (H/D/A) Odds Home Odds Draw Odds Away Last 3, %Win Home Team, at home Last 3, %Win Away Team, away P/L Accum. This chart shows the progress of the results by date. As you can check, this system makes a profit for most of the leagues and the period tested. This strategy is based 100% on statistical data. As we have mentioned many times, this kind of strategies are studied with historical data; nobody can be sure this system will continue making profits in the future. If you look closely at the chart, you can realise there is a losing streak from 25/04/14 until August 2015, and from that date, the system starts a recovering period. The drawdown in the betting systems are very common, but it’s not an easy task to face. Sometimes you have to choose whether to continue with the system or to quit thinking that the strategy is not successful anymore. Additionally, the psychological effect is tough to overcome; a very long negative streak can be very hard to bear. To reduce the risk of that, we recommend you not to pull all your eggs in one basket. You will have more chances to success in the long term if you can combine some systems within your personal strategy. We are here to help you, publishing more studies of this nature. From now on you can receive the picks triggered by our strategies directly in your email account. We will send all the bets included in each strategy to anyone interested in receiving that information. Press the “Follow this Strategy” button below. If you want to propose a particular betting system to be analysed, please send us an email to support@betaminic.com or using our contact form, we will be glad to help you. In Betaminic we are a team with wide experience in the world of sports betting. We want to share our background to help you improve your betting results. Copyright © 2019 Betaminic Bigdata Solutions, S.L.